Today, copyright is everywhere, surrounded by a thicket of no trespassing signs that mark creative work as private property. 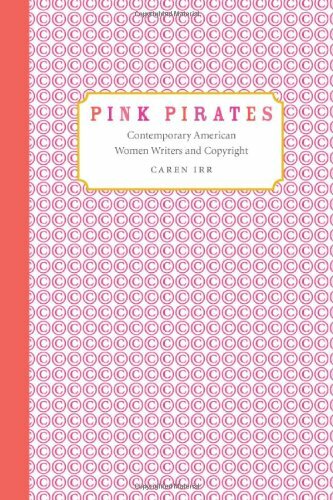 Caren Irr’s Pink Pirates asks how contemporary novelists—represented by Ursula Le Guin, Andrea Barrett, Kathy Acker, and Leslie Marmon Silko—have read those signs, arguing that for feminist writers in particular copyright often conjures up the persistent exclusion of women from ownership. Bringing together voices from law schools, courtrooms, and the writer’s desk, Irr shows how some of the most inventive contemporary feminist novelists have reacted to this history. Explaining the complex, three-century lineage of Anglo-American copyright law in clear, accessible terms and wrestling with some of copyright law’s most deeply rooted assumptions, Irr sets the stage for a feminist reappraisal of the figure of the literary pirate in the late twentieth century—a figure outside the restrictive bounds of U.S. copyright statutes. Reviews: Madeleine Monson-Rosen (Mediations, 2010), Sean Latham (Modern Language Quarterly, 2012). could somebody please re-up this book? thanks!